Last week was all about improving my health and my energy levels. Therefor I jumped on the juice cleanse wagon last Monday, all prepared to spend my week with a stash of Uzuma healthy green juices. 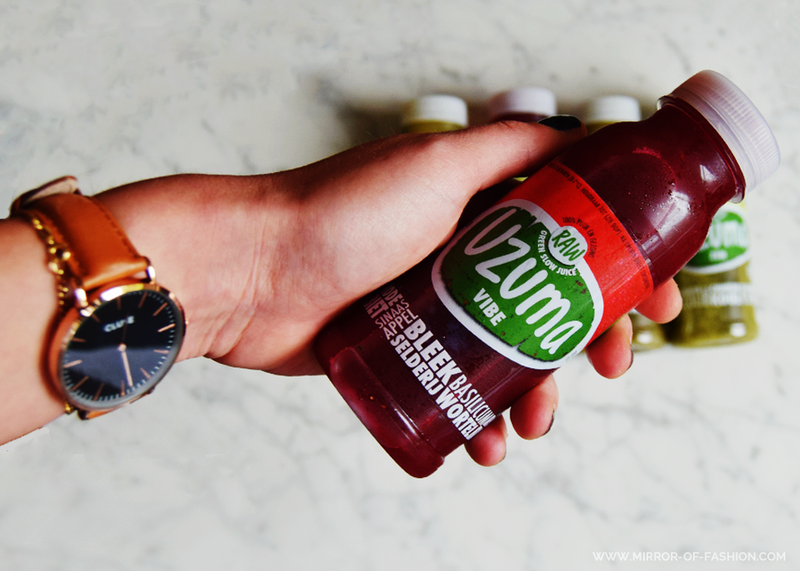 Uzuma is known for its preservative, fragrance, coloring and flavoring free green juices, all slow juiced for maximum vitamin and mineral retention. As I felt a bit tired lately and wanted to restore some energy I decided to try out their detox program to give my body a break from the fast but not so healthy snacks I've been eating due to busy schedules. Two weeks ago I got my five days detox delivered at home; seven fresh and cool juices for each day and with a manual attached on which juice to drink at what time exactly. On Thursday and Friday I continued my juice cleanse and today I am feeling more healthy and fresh, I notice strong improvements in my skin radiance and I am experiencing far less junk food cravings. Am I convinced of the juice detox benefits? I sure am! Can I give you an honest review? Unfortunately I don't. Not only have I cheated with having diner on Wednesday night, I also blame my boyfriend for providing me with that extra glow on my face and a natural energy high. He has put a ring on it and I couldn't be more looking forward to spending forever with the love of my life and my best friend.